Wissy's blogspot: Memorial to the few. 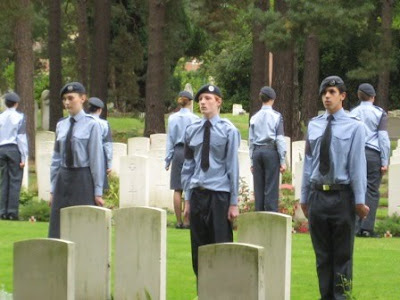 My youngest son Josh is a cadet in the Air Training Corps (ATC) and his squadron was asked to participate in a memorial parade to remember the Battle of Britain as part of the nationwide commemorations. 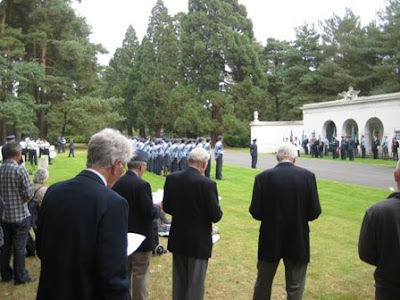 The parade was held at the RAF shelter in the Commonwealth war graves section of Brookwood Military Cemetery, one of my favourite places as told in a couple of my previous blogs (here and here). 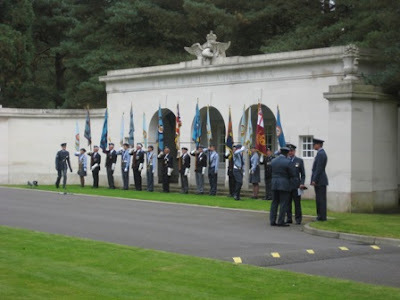 The flags in front of the RAF shelter. For those who are not familiar with the Battle of Britain, this was the air battle over southern England in the summer of 1940 that helped to deter the threat of a German invasion of Britain following the fall of France and the Dunkirk evacuation earlier that year. Their great deed was summed up admiradly by Sir Winston Churchill in his famous rousing speech when he said that "so much was owed by so many to so few". 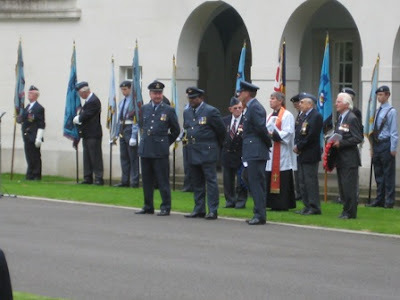 The service was attended by veterans of the Aircrew and Royal Air Force associations, ranking RAF officers, members of the Air Training Corps and the Lady Mayor of Woking together with members of the public. The Salvation Army band provided the music for the service, hymns and formal march past. The top brass prepare for the march past. The march past by the Air Training Corps. I was quite moved by the occasion. It was good to see the old veterans proudly bearing their campaign medals mixing with the young ATC cadets. It hopefully means that their sacrifice will not be forgotten and the young appreciate what they did for their country. 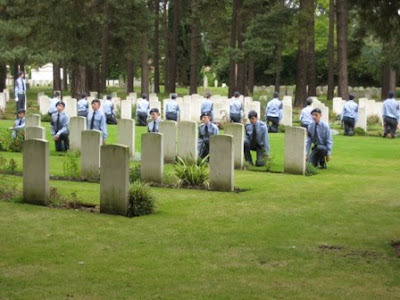 As part of the commemoration the cadets had to lay small crosses at the graves of the RAF personnel killed during the second World War. Josh was given the task of laying crosses at the graves of two brothers buried side by side. I think he found the experience quite moving and hopefully was proud to be taking part. I certainly found the whole episode quite poignant. Laying the crosses at the graves. 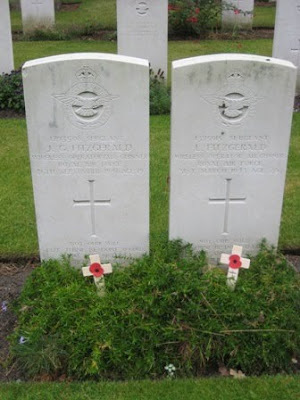 Note the headstones together denoting the two brothers killed in action. The brother's headstones with memorial crosses. The cadets show their respects. Josh is middle front. I can't believe how grown up Josh has become. I can still picture him when he was about 8! Thanks for your comment Pat. Yes,all of a sudden he's grown up! He's almost as tall as me, but i can still take him!!! Porthcawl - a Welsh seaside town.